As many know, our company has deep Brazilian roots, as such we have no choice but to enamored with the upcoming World Cup. Yes, the World Cup is coming, soccer news is everywhere and like most things, websites are being used to disseminate the news. The Federation Internationale de Football Association (FIFA) is perhaps one of the largest websites in the world dedicated to Football (a.ka.a Soccer for you Americans) news. This morning however I awoke to the most startling of news; Twitter was all the rage with the most unexpected, yet expected, FIFA appeared to be hacked. 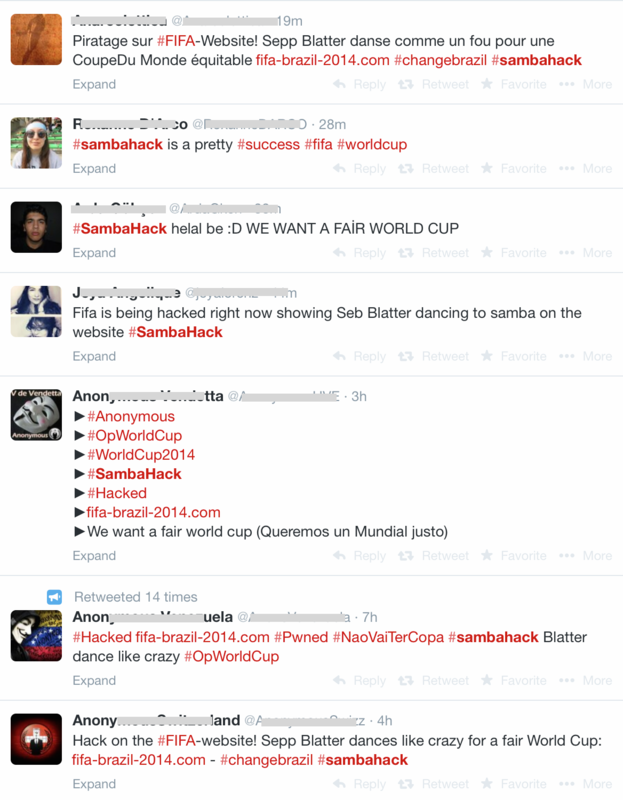 Is it possible that the Fifa website was hacked? Could it be Hacktivism? 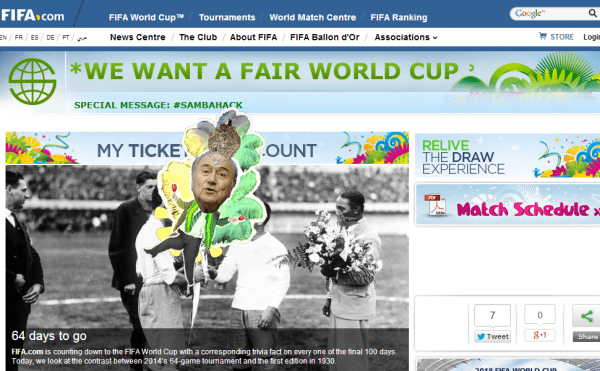 Everything in the site looked the same, except that they added an animation of Fifa’s president, Joseph Sepp Blatter, dancing with a funny song. At first glance it seems to be legitimate, but taking a closer look you quickly realize it is a fake. Fifa’s official website is www.fifa.com and the one that is being reported as hacked, defaced, is www.fifa-brazil-2014.com. If you search for these two websites on Google, you will get the same description, which can certainly lead people to believe that it is a legitimate website for FIFA. If you take a minute to dig a little deeper though you’ll find it’s really not. 236.13.196.82.in-addr.arpa domain name pointer samba-hack.feinheit.ch. What’s most peculiar however is that they appear to be in the same city. Definitely an awkward moment for sure. Opportunistic attacks can happen at any time, we can’t allow ourselves to be fooled by what we find online (even if it comes from Twitter, especially if it comes from Twitter). We have to remain diligent when visiting websites we’re unfamiliar with. This caution extends to Google as well as you can see above. Although this specific attack only injected a defacement, the attack could have been much worse, it could have been used to deliver a desktop trojan or any variety of other malware payloads. Read more: Was the FIFA Website Hacked? Story added 4. June 2014, content source with full text you can find at link above.